Once you start to gain interest in jewelry and that you try to know more about it you quickly face specific terms. These terms don’t always speak for themselves and to understand them you actually need to read their definition. To help you learn faster, I’ve created the glossary of jewelry, ring and diamond terms that you should know. 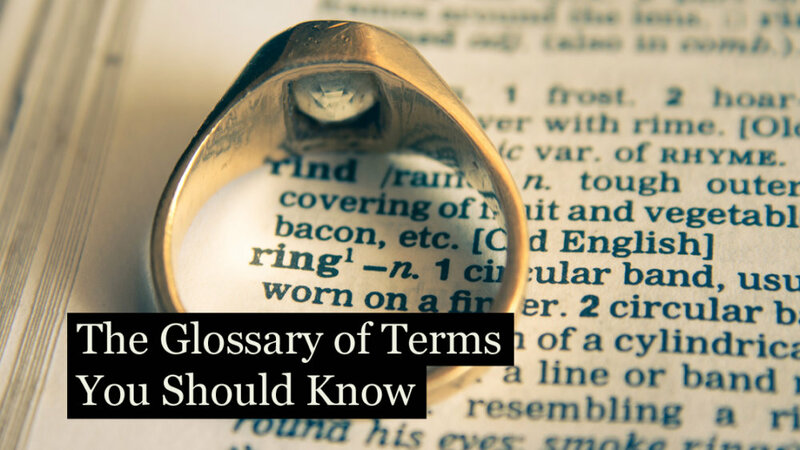 There are 396 terms in this jewelry glossary so don’t hesitate to use CTRL + F to quickly jump to the definition you are looking for. Hope this glossary helps! 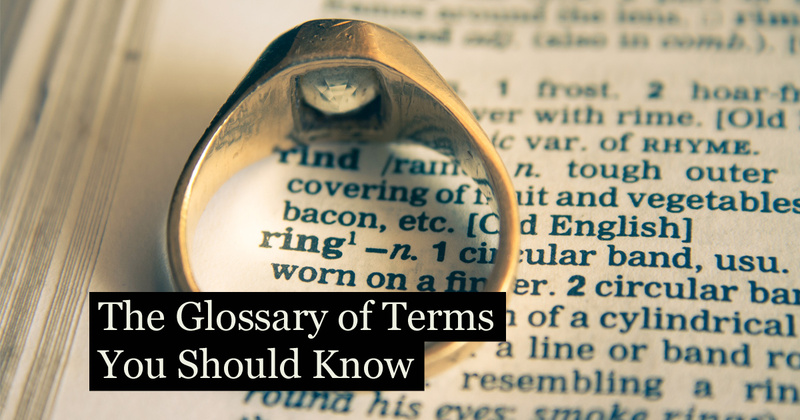 You can also download the Glossary of jewelry, ring and diamond terms. You already know many of these terms? 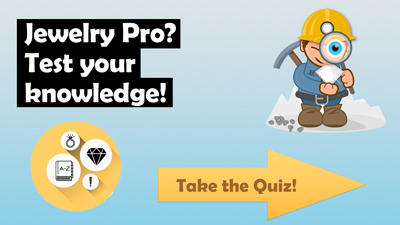 Test your knowledge, take the quiz! Platinum is one of the hardest popular metals. Often used in engagement rings. A white metal. Platinum is pure white metal from platinum family, stronger than white gold.Often used in engagement rings. A white metal. Platinum is harder than gold, softer than copper, and the whitest of the jewelry metals. One of the terms used to define the weight of the diamond; part of the 4 Cs. One of the terms used to define the amount of pure gold that is present inside a metal. Cut with 58 facets that are found to reflect the lightest from a stone. A diamond that hosts a square cut with 96 facets. Cut diamond with both scissor and step cuts on the crown containing 70 facets. Large, dramatic stone rings that were invented to be worn at fancy parties to be eye-catching. Also called an anniversary band of platinum or gold, given to mark an engagement, continued love, or to mark a child’s birth. Popular European style ring that has two hands clasped together. Please fill in your first name and your email so I can send you your results and the answers right now! The American Gem Society created by 1,000 jewelers of high recognition. The top gemstone grading organization. The American Gem Society Laboratories, one of the top gemstone grading organizations. American Gem Trading Association, another of the top gemstone grading organizations. Ornament designed to be worn as a hat. A setting that is open designed to leave facets open to light for reflect light better. The minor impurities that cause color in stones, a pure stone would be colorless. Mixing of gold with different metals to increase hardness and color. A piece of jewelry designed to be worn on the ankle. A way to heat precious metals used with color gemstones. Heating and cooling metal to restore its less brittle state. Evaluative process where a jeweler assesses how much a diamond is worth, considering characteristics and dimensions. A way to test the purity of an alloy where a small metal piece is scraped from the piece. Decoration characterized by weaving leaves and branches together. Art and jewelry from 1920s and 1930s that are bold and vibrant. Art and jewelry from 1890-1914 that features free flowing curves and natural forms. A way to weighing things aside from precious metals and jewels, with units of 7000 Troy grains, consisting of 5760 grams. Worn as pendants to accommodate a chain, cord or thong. A narrow-banded head piece that is worn low on the forehead. A bracelet that slips over the wrist. Immediate initiated transfer of money from your account. The standard way to measure thickness of sheet or wire; when the gauge is lower, the material is thicker. Metals used to alloy gold jewelry. A clasp that has a bar shape found on the back of the jewelry. Pearls or stones that are shaped strangely. Irregularly shaped pearls that are not symmetrical and are often uneven. A clasp that connects two ends of a piece of jewelry. The famous oyster where the Tahitian Pearl was found near French Polynesia. A dark pearl that grows in the black lipped oyster. A three-stranded (or more) necklace constructed from pearls. Pearls that are grown in Lake Biwa in Japan; cultured and freshwater. A pearl occurring naturally that forms when a parasite breaks through the outside shell of a mollusk, secreting nacre and cementing itself to the shell. Alloy composed of iron and gold of light blue color, not often used in jewelry because of its brittle nature. A pearl that has color from foreign contaminants, usually dark-colored. Metal alloys created to melt before the alloy that a jeweler will join together. A stone that is faceted to be shaped like a tear-drop. Clasped jewelry that uses a pin and can be worn on clothing. An appearance where metal looks like it has a brushed texture. An obvious void where crystals and foreign substances are included, but so refractive they look like cavities. Distinguished from coin, 24k of fine gold or silver. Furnace used to eliminate wax from molds used to cast jewelry. A setting that looks like a buttercup flower with tall prongs that secure a stone in a scallop design. The fitting that attaches the earring to an ear. Earrings that are styled with flat backs that lay against the ear. A chain that has a rope texture made of oval links. A carving that is styled where the design motif remains and the surface is cut away. Cutting of stone where it appears to be rounded and cut for the best effect based on the stone. A process used for making jewelry where you pour melted metal into a mold. Small hole in the diamond or gem stone, a tiny flaw. Centrally located stone that is the largest in a jewelry setting with multiple stones, also called a solitaire. Small metal casting making process that’s used in jewelry shops. The blueprint of a diamond, also called the cert, grading report or what the dossier confirms the exact properties. Jeweler members who have completed several advanced courses granted title by American Gem Society. A setting that holds a lot of gem stones in place, either parallel with gold or other metals where the stones touch and there’s no metal between the stones; this setting is supposed to give the appearance that the gemstones are floating. Grooves that hold jewelry setting in place used for anniversary bands. Called dusters, they’re earrings that are shaped like chandeliers. Decorative ornaments that hang from jewelry. The optical effect where light reflects from the stone, looking like a cat’s eye. Gemstone flaw created by damage from another surface. The presence or absence of inclusion from minerals, birthmarks, fractures. The instrument on the end of necklaces and bracelets that you open and close to connect two ends. A type of setting with metal prongs that hold the stones in place; typically used for transparent, faceted stones. A jewelry piece that connects ends together to hold a piece of jewelry in place. Small gemstones designed into jewelry that keep it clustered in a circular form. Metal that is stronger than nickel, colored material for blue glasses which stimulate gems. Jewelry pieces that are circular that are made of metal to secure a stone. Necklace that surrounds the neck like a coller; French for coller. The more void of color, the more valuable the stone. A rounded inside edge band that eliminates pinching. Either the lack or presence of flaws on a stone. Small flaws, bruises, or chips outlined by cleavage; often found on diamonds after wear. Soft medal used in jewelry; used to make bronze, gold alloys, and brass. A type of setting where a gemstone is held by metal claws. Where light is reflected without escaping from the stone. A piece of jewelry that is designed to be worn through holes in the sleeves of shirts. Standard cable chains that are oval or flattened rounds. Though often called drop earrings, they are similar but longer. The company that mines 45 percent of the world’s gems and diamonds. A carved surface decoration that is created by lasers or acids. Half hoops earrings that form a semi-circle. Vintage jewelry in a matching set that consists of two pieces like an earring and a necklace. Multiple stranded gems or pearls that are choker length. Hinged-bottom earrings that hang below the earlobe. Two halves of a piece of jewelry, typically a pin or a brooch, that can be worn apart or together. Earrings that hang below the earlobe while being slightly shorter than dangle earrings. Deadweight abbreviation that is described in pennyweight. Pieces used to make earrings that surround a stud to hold it in place. A gemological institution that is focused on certification and research, one of the oldest institutions in the US. Bonding process that merges a thin layer of material to another material. A process for stamping in a pattern where you press on a plain piece of metal to leave the pattern in relief. A type of cut where a gemstone is stepped, with cropped corners. A substance that is created by fusing colored powdered glass to metal that makes a decorative surface with a glass appearance. A procedure for engraving that is used on plain metal and used for cigarette lighters and powder compacts. A procedure for gouging out metal with tools into a design; typically using. Treatments that increase the diamond’s qualities, such as oiling and heating. Gemstones that are attached to tremblers to help create movement when the jewelry is being worn. A process where the surface of the metal is removed for decorative purposes using acid. A girdle gut with facets. Small, polished surfaces that give a diamond a finished diamond shape; helps change the sparkle. A mechanism that attaches jewelry, such as bolt ring, jump ring, padlock, pearl fastener, trigger and magnetic. Fittings for earrings that attach jewelry together, such as andralok, andraslide, clip, continental, hook fitting, and lever back. Wire that is gold or silver that has been twisted into patterns and soldered into place. Pproportion of precious metals, like gold or silver, in a metal alloy; typically measured in thousandths. Materials and parts that create jewelry like stems and bails. Also known as fake or imitation; used to describe simulations. Standard mechanisms in jewelry that are used for repair work; consider lobster claws, settings and shanks. An internal flaw found in corundum, like an inclusion. A material used for soldering. A thin sheet of metal that is placed in a closed setting at the base of the gemstone to make the color of the stone look better. Often seen in watch closures; a hinged and jointed clasp. Tension pieces that are used to hold earrings in place for people with non-pierced ears. A type of pearl that is found in mussels in several countries in the world, like China, the US, and Japan. Authentic of a diamond’s quality, issued by the Gem Certification and Appraisal Lab. A professional that completes courses of gems and passes exams to become certified in gemology. Natural minerals found in earth’s rocks that’s suitable for jewelry. Gemological Institute of America, diamond grading industry leader. Covering one material with a thin layer of gold. Also called a star setting; with a recessed stone. Proportion of girdle to the rest of the stone. Precious metal that is yellow in color and very soft when found pure, also, one of the most malleable and ductile metals, often mixed with other metals to reduce the price. Unlike gold plated, it appears like karat gold, but contains about 100 times more than gold in gold fill; sometimes called rolled gold in the US. A gemologist with professional credentials earned from GIA. A unit used to measure pearls. The weight in the metric system based on a cubic centimeter of water. A mechanism for engraving jewelry; appears like a chisel. A gold alloy with a high percentage of silver alloy. The product created when translucent enamel is applied to metal with engraving on it. A mark that is applied to jewelry and silverware to guarantee authenticity. A detail for decorative purposes that looks as if indentations have been hammered into the metal. The main part of the setting, holding the diamond in place. Range of sizes that can be mounted to a head that is determined by .carat weight. Diamond that is pear-shaped with a cleft. Mmeasuring from the top of the diamond, the estimated size. Physical part that locks jewelry into place. Process that enhances or removes the color in a stone or diamond. Diamond’s color that helps determine if it’s pure or has any other color. A diamond report that describes a diamond’s characteristics, which is analyzed by gemologists based on the 4 Cs. Independent Gemological Laboratories that specializes in grading jewelry and large diamonds. A foreign particle that obstructs the gemstone, such as an air bubble; often inclusions can make the value of the stone decrease. A cavity that has been removed from a stone and replaced with a different material. The Italian word for carving where a gem is engraved into an object so it sits below the material. A type of setting that is channel-style to secure gemstones without showing metal when looking from an aerial view. A viewing phenomenon where the hue of the stone’s surface changes when you shift the angle of the stone. A metal that is related to platinum. Soldered or screwed piece of jewelry that is pinned or fastened to another piece of jewelry. Tells you the amount of pure gold that is present inside a metal; not to be confused with “carat”. Round pearls that are formed in the soft cavities of pearl after it has been ejected by the mollusk. This is recommending for large pearl necklaces, a strategy where knots are tied between each pearl in a strange to keep them from rubbing against each other. Hinged lever earrings that act as clasps. A case on a necklace that holds a keepsake. A lens used by jewelers to study gemstones and hallmarks. A type of pearl that is formed when a half-bead is affixed to the inside of the mollusk; when the pearl is removed the hole is filled with paste, wax or another bead then covered. An imitation pearl that popularly derives from the Spanish Island of Mallorca; very popular in the United States. Four straight-lined arrow-headed that meet at center points that are used to design on jewelry. The soft tissue in the mollusk that secretes nacre and used for pearl formation. A dull, non-reflective finish on polished metal. Rare chemical element that is of high economic value in art and jewelry; less reactive than most metals. Instrument used to measure an object that is to be gauged and brought up to the end of a screw. Pearl brand founded by Kokichi Mikimoto, the creator of cultured pearls. Small, interwoven rows of links that form mesh. One thousandth of a meter. A type of setting where thousands of tiny beads support the stone. The type of cut that has both brilliant cut facets and step cut facets. A scale used to determine the hardness of a stone created by Friedrich Mohs. Form that you can shape metal in while it’s in a molten state. The lining on the inside of the mollusk shell or oyster that is famous for small objects and buttons. Settings, channels, etc. ; holds a gemstone in place. The substance that leaks from the mantle of the mollusk. A federal law that was enacted in 1906 that controls the quality on articles made of gold and silver. A stone that is oval shaped and pointed at both ends. A long necklace that dangles with drops and tassels of uneven length. An inlay technique for silver and gold that is turned black for contrast. Industry leader in Diamond Grading; The Northwest Gemological Laboratories. A metal used to make jewelry that is white, ductile and malleable. Element used in steel alloys that is silver, soft and ductile. Freshwater pearls that come from another mollusk used to encourage pearl growth. Affects the stone’s symmetry that is a major gemstone cutting problem. Due to the color grading scale, it’s a stone that shows more or less of a tint of undesirable color. A way to increase gemstone color, not permanent. The phenomenon where a gem looks like it’s yellow-red in some light, but blue in scattered light. A necklace that lays on the breastbone, about 34 inches at most. Mother of pearl shells that have the pearly luster. Pearls found in the Persian Gulf that are almost non-existent because of pollution. Part of the platinum family, might be the heaviest element known. An oxide formed from a base metal like copper in sterling silver, unlike discoloration. Pure white metal from platinum family, stronger than white gold. The natural use and age on a surface formed by imperceptible scratches that can disrupt the surface. A calcium carbonate formed by sand, shells, or other substance that is smooth different colors, though commonly found in white. Rope (45 inches); opera (28-34 inches); matinee (20-24 inches); princess (17-19 inches); choker (14-16 inches); collar (12-13 inches). Not necessarily a pearl, but a pearl-like appearance on a gemstone; also, a type of finish that is semi-transparent. The carat weigh multiplied by the carat cost is the total cost of a gemstone. Troy weight unit used for weighing metals, abbreviated “dwt”. One of the hardest popular metals. Often used in engagement rings. A white metal. A type of visual effect where a stone is diffracted, causing it to appear to be a different color depending on how you look at it. Colored enamel you can see through which lets light pass through; when translated, it is literally “glimpse of day”. Gold alloy that is marked with small tolerance; nothing less than 14K gold. A system that jewelers use to determine carats out of 100 points. A tool that jewelers use to study substances and their properties. A way to extract metals from masses containing impurities. The effect you see when light enters a medium with a different optical density and it bends at a different angle. White precious metal that is in the platinum family. Belonging to the platinum metal group, it is a transition element that is plated in either a silver or white color; it is used to brighten gold, polish gold, or make a surface harder. Single-stranded gemstone necklace all of the same size and cut. Also called filled gold, a sheet of old that is laminated to something like brass, then heated with two layers of heated pressure to fuse together. Bead that acts as a spacer between other types of beads with contrasting colors. Grainy girdle circle with nicks. A metallic element that is part of the platinum group that melts about 24000 degrees C.
The way light reflects of a stone or diamond. A center-stone setting that may be set with smaller side accent stones. Of the three categories of gemstones, this is the second largest, such as topez, garnet, amethyst. Stones that are set next to a center stone; not like accent stones. Harder than gold, softer than copper, and the whitest of the jewelry metals. IT is malleable and ductile. A fastener that is open-framed where a chain is passed. Joining metal together by melting one piece into another piece at the joints. Jewelry with a single stone. Weight of a substance in relation to an equal volume of distilled water at 4 degrees C; it helps determine gem identification. A tool that is used to identify gems. A type of cut, like an emerald or baguette. The arrangement of the angles and facets a jeweler creates. The width of the table facet; called the face. Exposure to air and moisture that causes metal to dull. Increasing the hardness of metal by heating gradually. A thin bracelet that is flexible created with alternating, linking gemstones. A piece of jewelry designed to be work on your head like a crown. Also called a tie slide, a thin bar of metal that attaches a tie to a shirt. Also called a tie clasp, attaches a tie to a shirt. Accessory that secures a tie to a shirt or holds a necktie together. A light, strong metal element that combines rutile and ilmenite that is used in alloys. Used for weighing precious metals containing 20 pennyweights each of 24 grains. Sterling silver alloy that is more resistant to tarnish than sterling silver. It costs about the same as sterling silver. An agent dissolved in a solution that vibrates lower than humans can hear, dislodging dirt. A procedure for testing metals in a diamond pyramid by a load of 5-120 kg. Forcing molten wax into rubber to make a pattern. A cut that has the proportions to maximize fire and brilliance. Nickel or palladium, alloy of gold. Alloy of gold, silver, copper and sometimes zinc, the most popular gold alloy. Tiny nicks along the facets that have hazy lines instead of sharp facets. In the setting of rings when each has a hollow spot for the gem that will be put into a square, enhancing its reflection. A way to cut a gemstone in a rectangular shape that is narrow. Rectangle diamond with facets that look like steps with two long sides tapering inner. A thin strip of material that makes up a ring. A ring with prongs that support a stone in a lace arrangement. Cut stone with edges beveled with one facet, the bottom is cut normal, and if it’s the same on top, it’s a double bevel cut. Cut along the top of the diamonds, called kite facets. Setting where a rim holds the stone, surrounding the gem. A ring setting for a stone where the top edges are burnished over the edges of the stone. An engagement ring and matching wedding band. Girdle that is cut with the intent to have a frostlike appearance. Ring setting where the sides are angled to draw attention to the stone. Ring design that is traditional featuring hands that clasp at a heart on the top of a crown. Large, center stone surrounded by a lot of smaller stones. A way to grade diamonds on an established scaled by the Gemological Institute of America; hues like pink, blue, green, and red are called fancy colors. Upper facets of the diamond leading to the top of the diamond. The degrees between the bezel facets and the plane of the table. The tip of the gemstone that may be polished in some stones. Diamond cut like a square or a pillow. Part of the 4Cs; an angle or proportion a jeweler creates while transforming the rough diamond into the polished one. Different kinds of diamond shapes. The way light enters a diamond and reflects. Set of rectangular, square or triangle cut for a gemstone. A cut where the corners have been cut off for protection. An addition facet that doesn’t have regard to symmetry. Diamonds that will not reflect an acceptable amount of light because they’re either too deep or shallow. Expensive diamond that is rare and could appear different colors, such as blue, green and yellow – often color makes it more valuable. Diamonds that are so yellow they transcend color scales. Damages to a diamond or other gemstone that reduces the value. A diamond fracture that looks like a feather, separating caused by a fracture or cleavage. White inclusions in a diamond that are wispy and irregular. No internal inclusions on the diamond. Highly valued and rare, they are perfect stones. A descriptive term for the outside of a diamond that describes if it’s polished or has an acceptable finish. Like dispersion; descriptive of the rainbow colors seen when diamond light reflects. A white circle in poorly cut diamonds that looks like a fish eye. Some settings have a fishtail shape in the setting side. The point where a cleavage opening results in an elongated cavity. The way a jewelry band surrounds a finger. Cleavages in a diamond that are thin. A broad setting at the top with a faceted stone that can be inserted into a ring. A property that some diamonds have when exposed to an ultraviolet light, typically gives off a blue-ish, yellow tint. The four critical aspects to consider in a diamond, including Carat, Color, Clarity and Cut. Called a feather; crack on a diamond. Molten glass filling that improves the diamond fracture and enhances the clarity. 58 facets on a gemstone. Two (or more) linked hoops that fit together to make them look like one hoop. The part of the diamond where the setting is affixed, the widest part of the diamond. Also called Grain lines that can be considered flaws on the inside of the diamond. A non-obvious ring that’s thin, typically worn in front of a more expensive ring to protect it from slipping off. A male-oriented setting that becomes thicker at the top, like a dome. A gem flaw & inclusion. A type of ring that is designed to make the center stone look enhanced by circling it with a bunch of smaller stones. The resistance a gem has to abrasion or scratching on a relative scale. A setting that surrounds a stone to make it look larger than it is, usually polished to enhance the stone. A ring that has a head and a shank created with one piece of metal. A boat-shaped and double pointed diamond shape that comes to curved sides at the end. A brilliant cut and step cut faceted diamond. A symmetrical shape that is elliptical; resembles a round shape that is elongated. Tapered holes filled with small gemstones. The bottom of a stone beneath the girdle. A head of a ring that’s made of 4-6 prongs that are soldered separately. Ornamentally designed jewel that hangs from a necklace. Silver-colored metal that is malleable made from tin and copper. Specked crystals inside a diamond that could form a hazy cloud in the stone. Four to six prongs that nestle a stone in the center; a setting that allows a maximum amount of light to reflect through. A pre-engagement ring that signifies a commitment. A way to determine the diameter of the wearer’s fingers and the size of his knuckle ranging from 4-13. A type of ring that is used to imprint either a family crest or a family insignia into wax for letter sealing or document stamping. The ring part that circles the finger. Square-shaped diamond with rectangular facets. Circular band of diamonds holding each stone by a bar connected between stones. Cut diamond with a traditional, modified with brilliant pavilion cut. Setting where the stones are set on a strip of metal, held by beads, raised from the surrounding metal. Small cracks on the outermost part of the diamond, called the girdle. A misshapen diamond with a deep pavilion. Definition used for carbonado and black diamonds. A flaw on a diamond or other stone. An elongated fancy shape that has a dark area that runs right to left in the center of the diamond resembling a man’s bowtie. Light leaking from the stone in an oval, marquise or pear-shaped diamond. Think Tiffany & Co; diamonds with trademarked cutting styles. Light reflected through the diamond, depending on symmetry and polish. The unit of measurement for a diamond’s weight. A diamond that has been enhanced by gemologists, not by nature. A crack inside a diamond; small cleavage won’t affect the stone’s brilliance. A small group of crystals, pinpoints that are formed in diamonds; small ones are not visible to the naked eye. Yellow, pink, blue and other colors of diamonds that fall into the D-to-Z scale. Diamonds that are from areas that are controlled by factions that are internationally recognized governments. A diamond stimulant made by man. The way a craftsman cuts the rough diamond, referring to angles and proportions, into a finished diamond. Derived by dividing a diamond’s width by its depth, helps figure out the brilliance of the diamond. Calculation of the widest part of the diamond. The hardest known natural substance that is also a crystallized carbon. The appraising of diamonds, can be recognized by gemological labs. Width and height of a diamond. The way light reflects off the angles and facets of a diamond, displaying the spectral colors. A diamond without blemishes and inclusions. The top 35 percent of diamonds that show a lack of brilliance. The way an evaluator will appraise a diamond and its characteristics to determine value. A change in the size of gemstones within the same setting. A fake diamond that is created in a lab with high pressure and high temperature. A diamond that is cut with the best combination of angles that allows light to not only enter but reflect back to create brilliance and fire. Flaws inside a diamond usually from irregulates and inclusions, only visible through a polariscopic. A classification or diamonds that are shaped in irregular ways. Small hole in a diamond from drilling into it to get rid of a flaw. Using a laser to improve the appearance of a diamond with dark inclusions. A mark or number that is lasered into a girdle in a diamond; only visible under a microscope. A way to make the flawed diamond better looking using hydroforic acid to radiate the surface. Diamonds that weigh between .5 and .75 ct.
Small diamonds that weigh under .2 carats that accent gemstones. A type of diamond cut that resembles an emerald and a brilliant cut. A diamond simulant that is man-made. A rough diamond with a small edge that is left unpolished. A long, thin crystal on the surface of the diamond, not usually visible with the naked eye. A diamond that has a lot of inclusions that won’t let light through the diamond. A cut of diamond that is shaped where the girdle outlines a pear; it has 58 facets. The measure of smoothness on a diamond’s facets. How a jeweler transforms a rough diamond into a finished diamond. A cut of diamond that is square or rectangular that has some of the sparkle and brilliance of a round cut. The relationship among the facets of the crown and the pavilion; this is directly related to the amount of light that is reflected by the stone. A diamond that hosts a square cut with 96 facets; 21 crown facets, 24 pavilion facets, and 49 brilliant facets. Square cut diamond with both scissor and step cuts on the crown containing 70 facets. The way light rays bend and pass through a diamond. Diamonds that are cut with 57 facets. Grades that include diamonds with inclusions that can be seen under 10x magnification. A diamond’s purity of color indicating the absence of brown or green hues. Diamond ring that is decorated with space for featured diamonds – no center diamond is included. A ring part where the diamond sits and is held in place. A less brilliant, vibrant diamond that is cut too shallow. The appearance and form of a diamond; round, triangular, square, marquise, pear, oval and heart shaped. Small diamonds with 17-18 facets. Light entering a diamond and reflecting through the same stone. The cut diamond’s top surface. The largest facet on a diamond, called the face. Pressure setting that holds diamonds in place by squeezing. A way to measure color intensity ranging from dark to light. The total weight of all the stones in the piece. A diamond that is triangular in shape with 50 facets. Diamond crystal structures that are irregular as a line inside the stone, typically not visible without tools. Setting designed to protect the fragile diamond points. A cut that is designed to let light enter the stone. Two grades of diamond have tiny inclusions you cannot see without magnification. Two grades of VVS Diamonds that you cannot detect even with 10x magnification. Hi, I am Franz. I’m a GIA student and I learn more and more about diamonds every day. I don’t consider myself as an expert but more like a curious person who likes sharing his discovery and the results of his researches. You can contact me on this page. Buy diamonds online? 4 reasons and 10 tips to buy diamonds online! Antwerp, diamond capital of the world? Check the answer divided into 9 sections. Download the Glossary of jewelry, ring and diamond terms now! Please tell me more about you and I’ll send you the Glossary of jewelry, ring and diamond terms straight away. Pour télécharger le guide, indiquez votre e-mail ci-dessous.